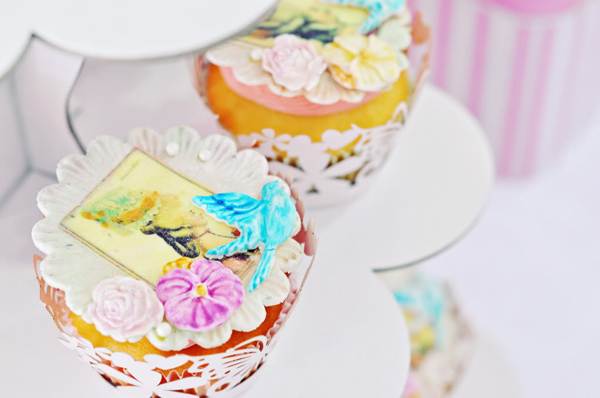 History can’t tell us for sure whether Marie Antoinette ever uttered those four famous words – let them eat cake. But we’re certain they were shouted with much gusto at this particular party. 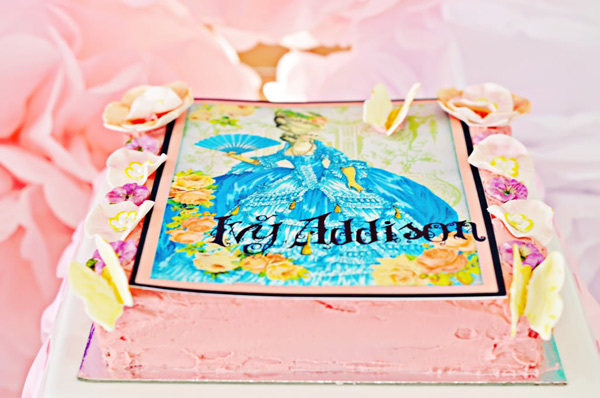 So put on your frilliest frock, pick up a parasol and sashay with us over to Ivy Addison’s most magnifique first birthday! 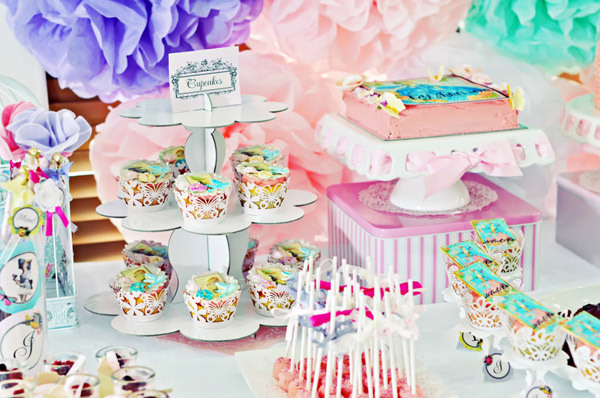 One of the most creatively-themed parties we’ve featured yet, Francophile mum Roslyn looked to Marie Antoinette for inspiration because she wanted a party fit for a (la petite) queen. Job done, we say! Over-the-top and indulgent the Antoinette-era court at Versailles may have been, but it was spot-on perfect for this happy occasion. Reaching the milestone of Ivy’s first birthday was, Roslyn tells us, the ultimate blessing after a tenderhooks pregnancy preceded by four years of heartbreak, when miscarriage after miscarriage seemed certain to shatter her and husband Danny’s hopes of becoming parents again. So if anyone deserves to go “completely overboard” (to steal Roslyn’s own words) at the joy of it all, we’re certain it’s this loving family. 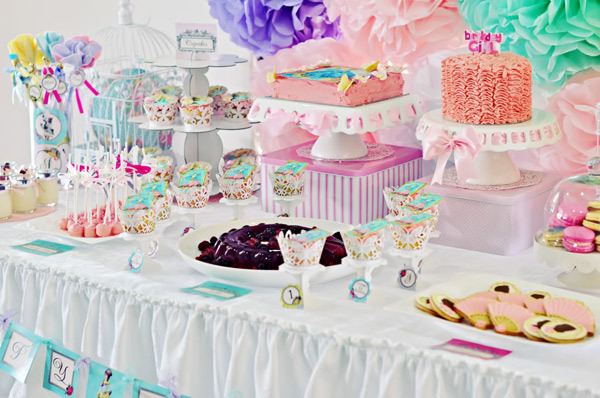 Roslyn found the perfect party invite and matching printables at Cutie Putti Paperie, adopting their girlish tints of pink, aqua, lavender and yellow as her daughter’s party colour scheme. Now, on to the party table. 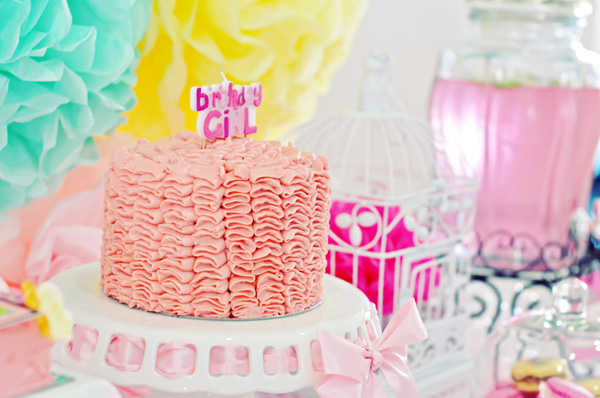 Roslyn made the pretty ombre layered ruffle cake herself, carefully following instructions she found over at My Sweet and Saucy, with an apparently foolproof Swiss meringue buttercream recipe from Sweetapolita. Roslyn, who says she’s no cake baker, modestly assures us the whole thing was easier than the stunning end results would have you believe. 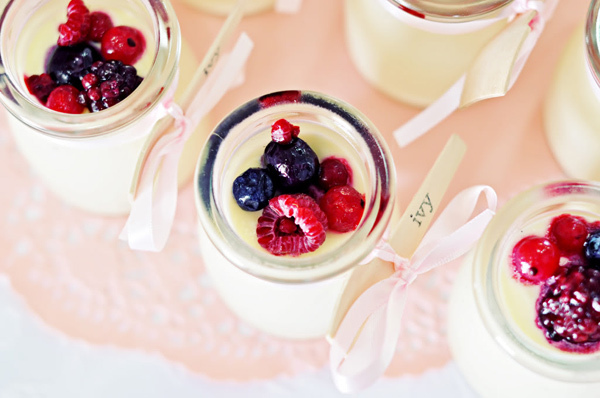 We applaud her talent – getting buttercream right in the northern Queensland heat is no mean feat! But Roslyn didn’t stop there. 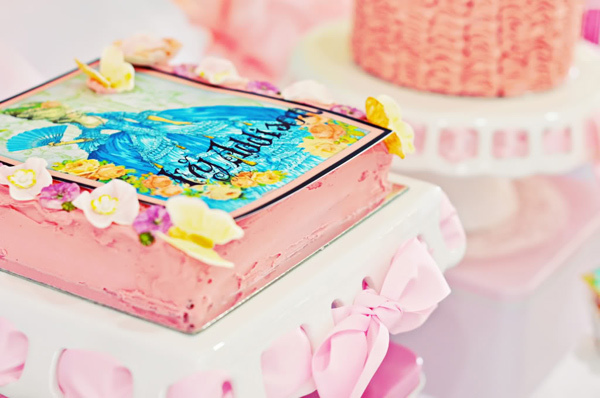 She made another cake too, topping it with a stunning handpainted piece of Marie Antoinette sugar art found at Etsy’s Alla Prima Designs, which arrived safely all the way from Texas, along with smaller fanciful toppers for Roslyn’s homemade cupcakes. 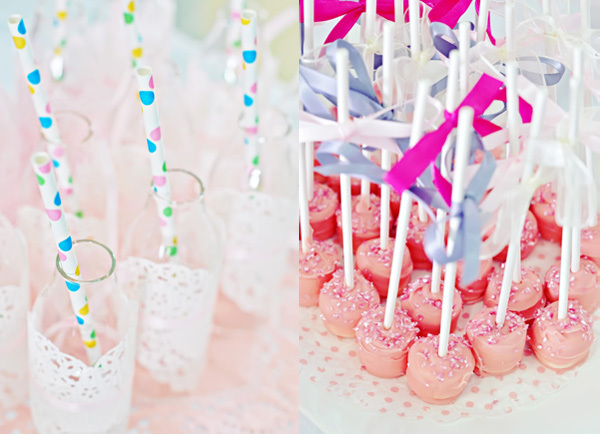 She also kept herself busy making pretty pink chocolate-covered marshmallow pops and even prettier white chocolate and berry puddings, perfectly presented in mini glass pots with personalised spoons from Sweet Style. 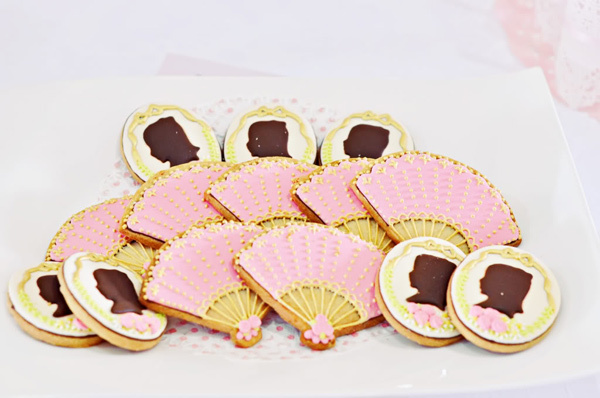 Spotted paper straws and glass milk bottles, which Roslyn fancied up with lace paper doilies, came from The Little Big Company, while the fancy fan and cameo cookies came from Melbourne-based Dessert Menu Please. Roslyn’s sister-in-law Kristy (who perhaps should be in the cookie business herself!) kindly made the delish-sounding salted caramel macarons. 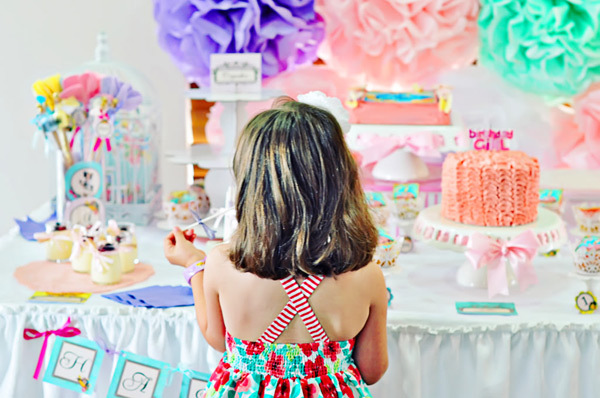 Ivy’s equally doting grandmother, Sue, whipped up the pretty ruffled tablecloth herself the day before the party, after flying in from her NSW home for the occasion. 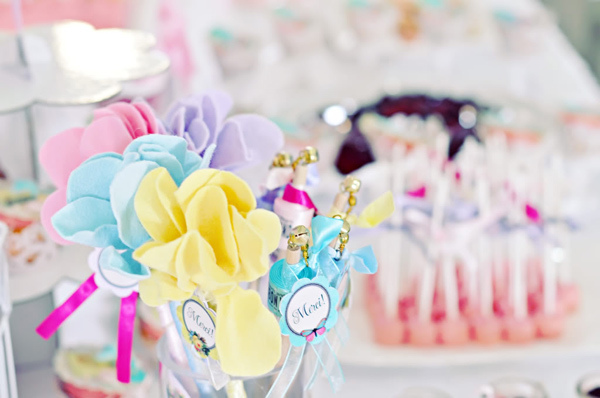 Those delightful ribbon and flower wand party favours below came from Pinwheels and Pearls, while Mrs Pom Pom can take credit for those decadent yet delicate balls of tissue floating atop the dessert table. Here’s the birthday girl with her understandably besotted parents, all photographed most beautifully by Candice Van Moolenbroek. Yep, la petite queen, ma cherie, most definitely!